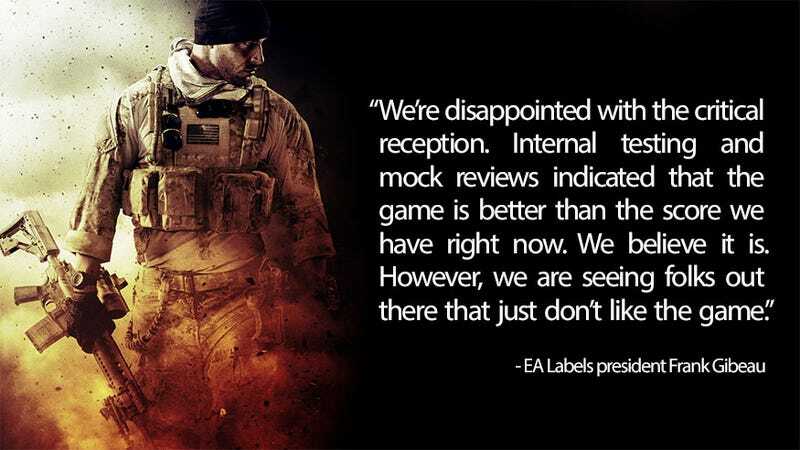 EA Thought Medal of Honor: Warfighter Was "Better"
That's EA Labels boss Frank Gibeau, speaking earlier today during Electronic Arts' latest earnings presentation. Now, I'm not here to kick a game while it's down. Whether you like Warfighter or not is up to you. But what I find interesting is the complete disconnect EA has seen-or is at least saying they saw-between its testing and the final reviews. This game didn't occupy some weird grey area on the critical scale, it was almost universally panned, at least amongst major outlets. Which is a problem for EA, sure, but it's also a problem for gamers. More varied and perhaps dare I say honest testing could have made this a better game. Unless…unless it was railroaded into a schedule that demanded it be released this holiday season, regardless of its quality at the time, or what internal testers really thought of it. And a major publisher like EA would never do that, would they?